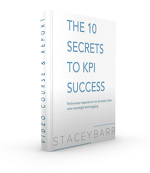 QUESTION: How do you identify KPIs for lofty strategic goals? You’ve probably heard this argument a lot, too: you’re supposed to keep strategic goals lofty and vague so that they are inspirational and broad enough so that everyone can find their own way to make sense of them and link their work to them. And maybe like me, you also think it’s hogwash. Goals are promises to close the gaps between as-is performance and should-be performance that are too wide to tolerate any longer. Strategic goals are the gaps that are the most important to close, such that the organisation takes the largest possible steps toward excelling at what it exists to do. Good goals are those whose gaps are observable in some way. If you don’t know how you’d recognise the gap shrinking, you don’t have a good goal yet. And that’s the problem with the typical lofty goals you see in strategic plans. No-one understands, or shares the same understanding of, what the gaps look like. What is the current gap between as-is health of citizens and should-be health? It makes no sense to ask that question, because ‘health’ is too broad. It isn’t just one gap; it encompasses many observable gaps. Disease, injury, fitness, nutrition, depression, substance abuse, stress, and more. So the question is not how to find KPIs for lofty goals. The question is how to turn lofty goals into measurably meaningful goals. The key to doing that is to explore the possible observable gaps, and then choose the one or two that are absolutely the most important to close. If you don’t do that, and keep those goals lofty, nothing will change in a measurably meaningful way. TAKE ACTION: Check if you have any lofty, hard-to-measure strategic goals. If you do, take a step back and ask what the goal really means. Try to describe the evidence of it being attained, of the gap between as-is and should-be closing. If you have lots of different types of evidence, then the goal is probably too broad. So break it down into specific and evidence-able gaps, and then work out which gaps are the most important to close. Then just measure those gaps. This is a really common issue for performance measurement in government (particularly human services), and I think the response here is very sound. Great post. 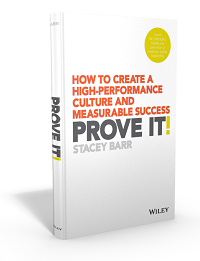 Your recommendation is very good Stacey, and while it’s concise, the actual task of stepping back and examining goals is tricky in a large organisational context. Culture is a strong factor in my experience: often, the very fact that something is lofty, vague and difficult to define becomes accepted as a reason not to push harder to identify the specifics. “Step back’ is The Key. Most of the managers are considered quite rational in the matters of professional decisions. More so,becuase ,when these days strategic decisions are always discussed among others, who would , at least , have [ or are expected to have] a differing points of views. The process of group discussion is noramlly expected to bring in the rationality in so far as clarity regarding identity of the observable gaps/ goals. 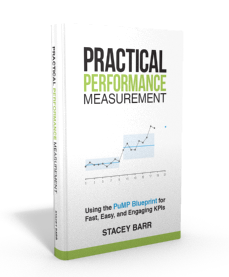 Once there is clarity about the goals, the process of indentifying KPIs and measurement techniques should also be apperent. However,there more cases where such a behviour is cospicuous by its absence. This may either be on account of the typical way the abilene complex – every one has fair idea that the decison is not in the right decsion, but no one voices the disagreeing view – operates in a group or for the untold fear of the results of the measurement analysis. The article should go a long way in clarifying such real-life situations.